Big Breadwinner Hog was before my time, but I do know of the controversy surrounding this violent crime drama in the sixties. 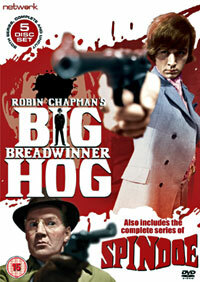 And if you want to see what the fuss was about, you can find out from 19th March 2007 when Big Breadwinner Hog is released on DVD for the first time. On its original transmission, Big Breadwinner Hog shocked some of the ITV companies so much that it was either moved to a late night slot or pulled from the schedules completely. Peter Egan played Hogarth (aka Hog) – ruthlessly ambitious, flash, violent and hated by old-school gang boss Lennox (Timothy West) for his "long hair, mod attitude and uncanny ability to upset the status quo". Written and produced by award-winning writer Robin Chapman and directed by BAFTA-winners Mike Newell and Michael Apted, it’s said to be one of the finest British gangster dramas. Also on the five-disc set is another lost sixties gangster show – Spindoe – which follows Alex Spindoe – ex-crime czar of the South London criminal gangs, out of prison and in the firing line from his old gang members, the North London gangs and the police. Both shows come with a vareity of extra too – we’ll have a review of the set online before the release date.